Lunch: Monday - Friday: 11:30am - 2:30pm; Dinner: Monday - Saturday: 5:00pm - 10:00pm. Happy Hour 4:30 to 6:30 Mon- Fri featuring 1/2 price draft beer, $6 wines, reduced price tavern menu items. Guests suites available seven nights a week. Private parties and wedding ceremonies/receptions for 50 to 130 guests can be hosted Saturday afternoons or anytime Sunday. Ample free parking on property. Complimentary Valet Parking on busy nights. In THE WARREN TAVERN: Thursdays: Live Music from 6 to 10 pm with special drink and food pricing. To see schedule of upcoming talent, visit website, call or e-mail us. 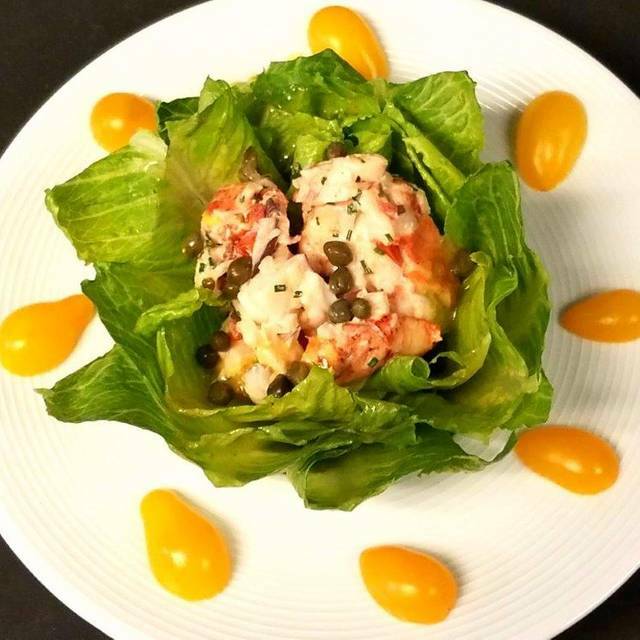 Happy Hour 4:30 to 6:30 Mon- Fri featuring discounted draft & bottled beers, house wines, $2 off all other adult drinks, reduced price Happy Hour Menu items .... Dinner / Suite / Breakfast Packages, starting at only $205 per couple. 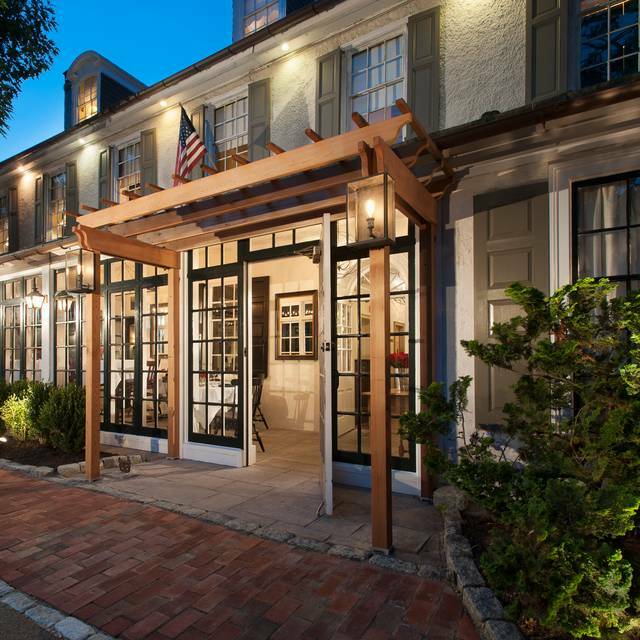 Step through our door and experience classic 18th century charm and hospitality blended with modern American cuisine, with all spaces recently renovated. Join us for your next special occasion or corporate event. 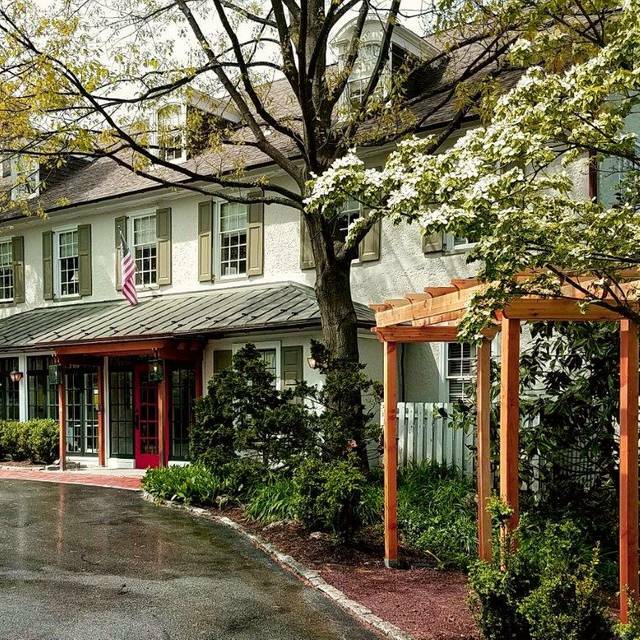 With three private dining rooms and the Springhouse Terrace, we can accommodate groups of 15 to 60 guests. 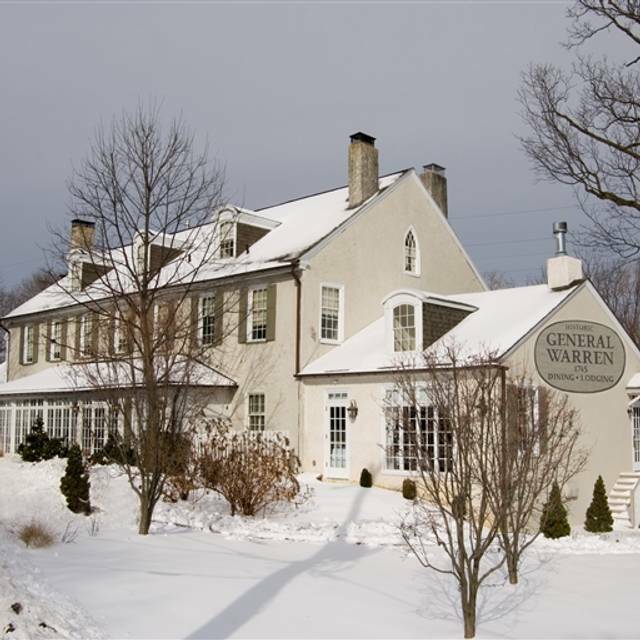 Historic 1745 Country Inn featuring American-Continental Cuisine with a contemporary flair, table-side prepared specialties at dinner, attentive service amid charming candlelit dining rooms, all with working fireplaces. Home of "The Warren Tavern", featuring a lite fare menu or the full menu, all available without reservations. Happy Hour 4:30 to 6:30 Mon- Fri featuring discounted draft and bottled beers, $6 wines, $2 off all other adult drinks, reduced price Happy Hour Menu items . Full bar and extensive International wine list. 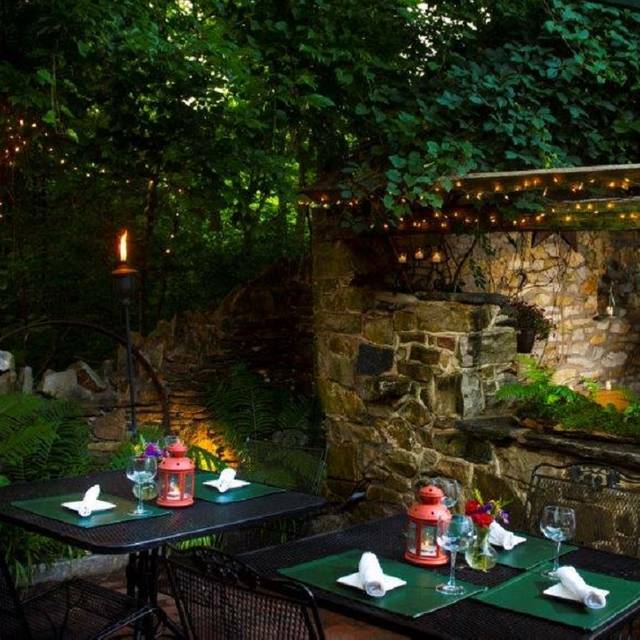 Outdoor dining at "The Springhouse Terrace", available all year-round for cocktail parties, receptions and intimate weddings and receptions. Three private party rooms for 15 to 60 guests, eight elegant guests suites for overnight stays, including a served continental breakfast. Treat mom to General Warren Hospitality for Mother's Day on Sunday, May 12. We will have a special ala carte and children's' dinner menu and serve from 12 noon until 8 pm. We suggest you make your reservations soon! The best lunch ever! It was a birthday celebration for my dear friend and it couldn't have been any better. MY friend was over the moon! Keep up the good work! we have dined at the GW many times and have always enjoyed the food and service.However the kitchen this evening was not on point. They overcooked my wife's filet twice at which point we were done.They did not charge her for her meal, however the evening was over. Excellent, as always. Never had a bad experience at the General Warren. 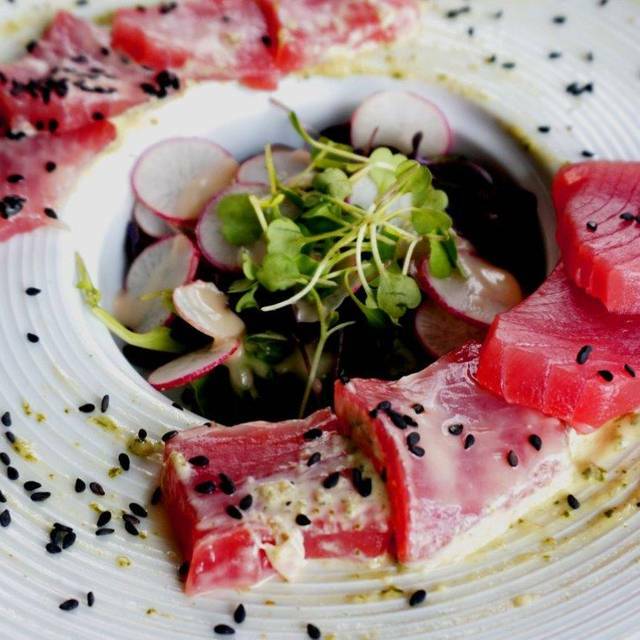 The team at the General Warren know how to deliver a completely satisfying dining experience. The quality of the food is outstanding, the staff is welcoming and attentive and the ambience is perfect. Our server, Maureen was indeed outstanding, pleasant as we enjoyed our dining. The appetizers and entrees that we selected were excellent. General Warren Inn has the best Snapper Soup in the area. Bananas Foster prepared at table side was also excellent. Our waitress was great. Looking forward to our return visit. Fantastic food, ambiance and service. Never disappoints. GW is great. Sandy waited on us and she is FANTASTIC. Loved the porch on a sunny spring evening! Wonderful service, food, ambiance. Our friends want to join us there again! 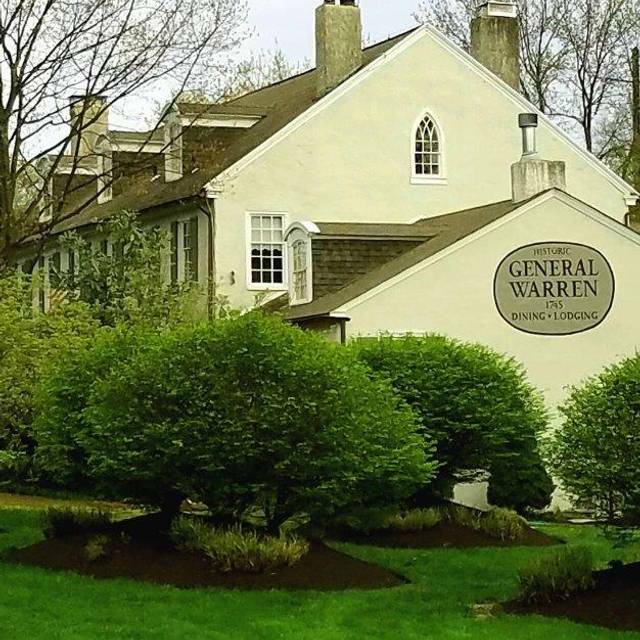 Our entire experience at The General Warren Inn was phenomenal. We've searched high and low for a wedding venue that feels right, needless to say we have been less than thrilled (for one reason or another) up until now. 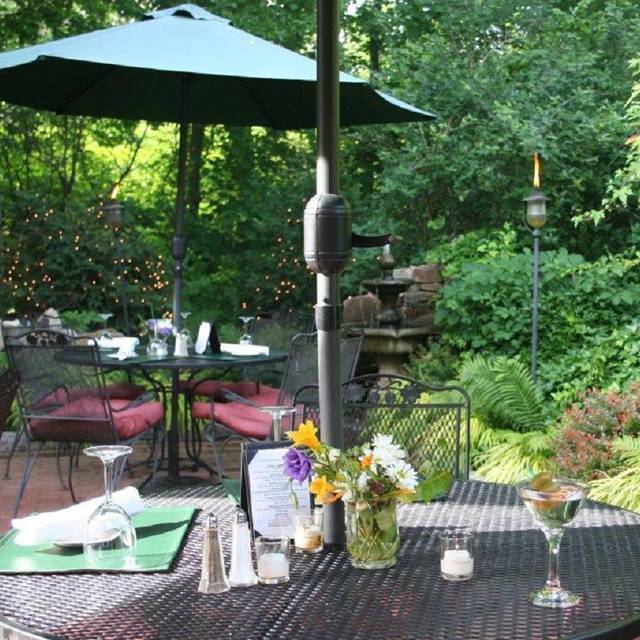 The Spring House Terrace's romantic ambiance, incredible food and impeccable service is remarkable. We can't wait for our upcoming wedding. Thank you Tim for being so hospitable at the drop of a hat! The whole experience more than met our expectations. Dan, our server, was terrific, as was Kim with whom he was teamed that evening. We will certainly not be strangers to the General Warren Inn. The service is very good and the place is lively. 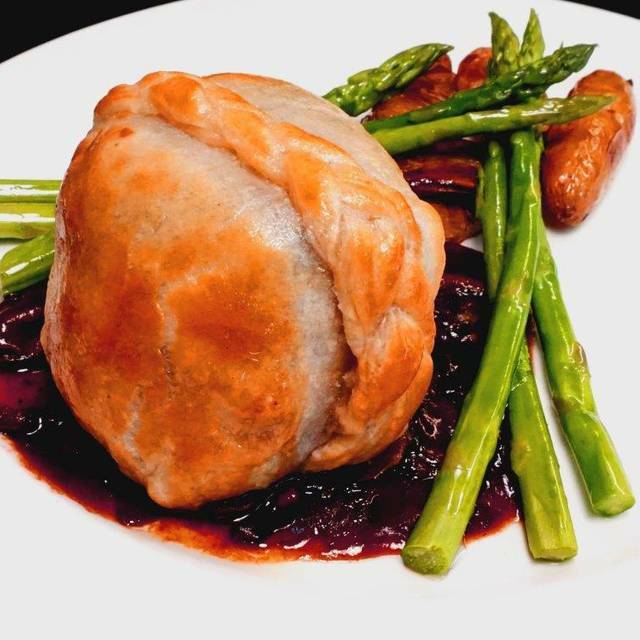 The sauces were over-salted, the roasted potatoes were mush, and the beef wellington crust was way under-baked. Good wine selection, great dessert. Our Host, Server, and Inn Keeper were all amazing. This was a wonderful evening. Thank you so much to the manager and waitress who helped me navigate my handicapped friend into the restaurant and seated, and then into my car after dinner. I hadn't been able to get my friend out of the house for months after she suffered a disastrous fall and I wasn't sure I could handle her difficulties. The staff at General Warren went beyond the call of duty in helping me. Aside from that, the meal was excellent: I loved the snapper soup and the beef Wellington; the latter has been a favorite of mine but is rarely offered in restaurants. My friend enjoyed the halibut. Again, my appreciation to the manager and waitress for their incredible kindness. General Warren is lovely, the setting is perfect for a special dinner. The downstairs and side "sun room" are especially attractive. Unfortunately our server left a lot to be desired. Even before we had settled into our seats or looked at the menu, she was at the table asking what we wanted to drink. We asked for a few minutes to decide; when she returned she told us the specials and started to walk away until we called back to order drinks. Cocktails arrived one by one (for a party of 4), 3 drinks were so haphazardly put on the table they spilled on menu and table. Server did not notice or comment. On the upside, the food was good as usual. The trout entrée especially received positive comments. We all had been at General Warren on other occasions and will probably be back again and hope we get a different server. Phenomenal service, food and drinks. Love this place and would recommend to anyone looking for a quality meal in a beautiful atmosphere! Table-side Caesar salad is my favorite. An excellent overall experience. Friendly atmosphere and excellent food. Lunch was outstanding as always. It was a special occasion meeting new people I hadn't known before. Everyone was very impressed with the ambiance and the food. Thank you GW! The entire staff treated my luncheon like we were the only group in the Building. I highly recommend General Warren! So glad we decided to go! Excellent as always, we come here multiple times throughout the year, usually to celebrate special occasions and they never disappoint. service is always top notch, food is delicious and there is always a veg option and GF options. Happy to report there is now a veg dessert option and it was amazing. The food is always wonderful, staff is considerate and friendly. It’s one of our favorite places. Had a wonderful meal and wonderful time. Our waitress was outstanding. Look forward to coming back! Great Atmosphere, great food, and great service. I will definitely go back! Perfect place to celebrate a friend’s birthday! The General Warren Inn was very good, the service need a little work but wasn't terrible. The food was very good, Snapper and French Onion soups were excellent, my wife ordered the 8 oz. filet and it was a little chard on the outside the inside was at the correct red/pinkness. Although some people might like the chard exterior of the steak she does not. Overall we were happy with the meal and would recommend this restaurant. Came here for my parents 50th anniversary. The ambiance was great. Food was hit or miss, some entrees were very good while others were oily and not as tasty. Our server was extremely good and accommodating to our children. My main complaint is that I had called in advance to let the restaurant know it was a special occasion, but they did not mention/mark it in any way. Excellent food and service. Would definitely recommend for any special occasion. First time and we had a wonderful experience. Maureen was a great server. She helped us out with menu and wine choices. We left thinking we can’t wait to return for summer faire on the terrace. Thanks for a fun date night. Never disappoints. Excellent food and excellent service. The ambiance is cozy/charming. Excellent service & food was amazing! We love the General Warren! Great food and ambience... we didn’t want to leave!!! What a Treasure! I selected General Warren for a very important business meeting - it was soon obvious that the waitstaff was accustomed to dealing with such a group. Her service was impeccable and the food was absolutely delicious and elegantly plated. I am very much looking forward to a return visit! We went to the wonderful, meet Ben Franklin event. Good period food and an entertaining lecture! Fireplace was nice in the tavern. The service was horrible. 7:30 reservation and didn't get food close to 9PM. 3 of the 4 dishes were not good. Even the salad had wilted romaine. I am flabbergasted. Expected exquisite everything from this restaurant. So far from getting that. When I reserved, requested quiet table because of profound hearing loss and need to use strong hearing aids. When we waited to be seated, Maitre’D (owner, fairly sure) made snide comment about how he doesn’t want to have a quiet table on a Saturday night. Strike 1. Our server had table of 10 and was unable to give us the attention we would normally expect. My friend and I both ordered filet mignon. Both medium well. Hers was fine. My was was medium at best. No one came back to check. 10 minutes passed. I had to get up and go into a hallway to tell my server. Strike 2. Meat taken away. My friend finished her meal and 20 minutes later my meat was returned as a charred mass that was inedible. Strike 3. I took two bites and that was it. Meantime potatoes were ice cold and so were green beans. Had to flag down server again. Told her I never waste meat (which is a precious gift from an animal) but the filet was inedible. Strike 5. She offered another dish which I declined. No manager ever appeared to apologize. In fact, she suggested I call tomorrow to complain. I said I would not be doing that. If a fine dining restaurant owner does not see fit to apologize when food was ill-cooked why would I call the next day. Strike 6. The valet parking gentlemen were very polite. I can recommend GWI if you’re just looking for a place to park your car.